Role: Striker. Zealots fit strictly in to the striker role, intent specifically on dealing damage and vanquishing their enemies. However, they have secondary defensive capabilities and can serve as a defender when needed. Power Source: Divine. Zealots employ divinely inspired attacks, empowering their attacks by the blessing of their Gods. Trained Skills: Religion. From the class skills list below, choose 4 more trained skills at 1st level. Characteristics: The Zealot is a predominately melee striker who uses divine powers to deal damage to their enemies. They utilize the same encounter, daily and utility power as paladins, but utilize different class features and at-will powers to enhance their damage. They possess secondary healing and defender powers, however they are not as good as dedicated leader such as a cleric and possess less health than a dedicated defender (like the original paladin). They gain powers in the same way as other classes and the paladin, but they are geared more towards dealing raw damage. Religion: A divine protectors of justice, they are heavily inspired by religion. The majority are strong believers in their faith, fighting relentlessly and with a zeal unmatched by most other divinely inspired characters. The forgo the natural defenses usually offered to them as paladins and instead focus almost entirely on damage, throwing away their own safety in order to inflict damage upon their enemies. Zealots believe that self sacrifice and undying devotion to their cause are the best ways to achieve their objectives, and thus they rush head first in to battle with very little concern about their own defense. Due to their chaotic and somewhat uncontrolled nature, they sometimes lean towards Good or Chaotic good, given how rarely they fall in line with the law and their own personal crusades for justice. A few still worship darker gods, using the raw power of their faith to inflict damage, with the same vigor as the more divinely inspired Zealots. Races: The Zealot naturally favors races with high Strength and Wisdom. This includes the Goliath, Minotaur and Shifter. Any strength based race can benefit, and humans are particularly effective in the role. Dwarves and muls are naturally inclined towards the role, as are Dragonborn, with humans performing much better in the role of a Zealot than original paladins. Zealots emphasize durability and power. Feats which boost your defenses, such as toughness or improved defenses, will naturally augment your already high defenses which can make you more survivable on the battlefield (given your reduced health compared to normal paladins). Damage feats, such as weapon proficiency or expertise feats, should not be neglected, especially if you are going a more striker oriented route. Feats built for the Zealot should be considered, such as the Avenger's Wrath (4e Feat) or the (Domain) Power of Vengeance (4e Feat), as should racial feats that are particularly powerful, such as Dwarven Weapon Training. Any feats or powers that boost radiant damage should also be sought after, as most of your powers also deal radiant damage. As you are a heavy armor dependent class with secondary abilities that do not boost lightly armored defenses (such as dexterity or intelligence), you should start with the highest armor you can, or plate. Choosing heavy shields or two-handed weapons will be your biggest choice; if you want to do more damage, you should go with two-handed weapons, which also can receive additional benefits with certain powers. As all of your melee attacks can substitute your enhancement with your implement bonus instead, it is an additional option to choose a magical holy symbol. Otherwise, standard adventuring gear is suggested. Zealots's use divinely inspired at-will powers for most of their attacks. As most of their powers deal radiant damage, it is recommended that you pick up abilities that boost radiant damage as well. 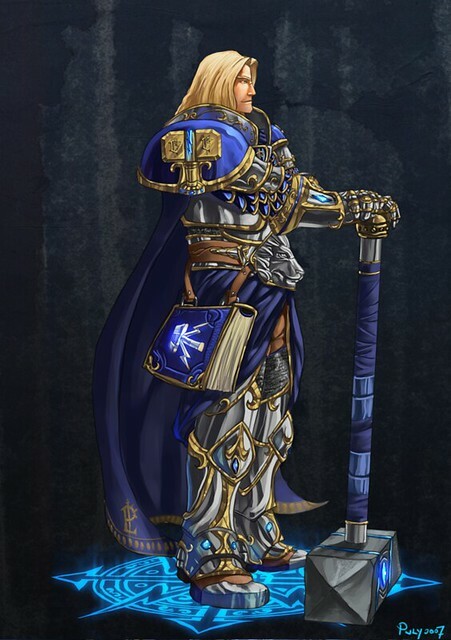 Zealot's are very similar to original paladins, however they lack many of the defensive benefits of being a standard Paladin. You must choose the "Crusader" or Paladin path to gain all of the following features. You cannot simply choose some of the features as new additions to the paladin, but instead are given these powers by choosing the path. You use all of the same paladin encounter, utility and daily powers, but must use the described class features. You can choose at-will powers from the paladin class in addition to the newer at-wills presented. It's important to bear in mind that some paladin abilities allow you to mark or focus on defender oriented abilities; for encounter and daily purposes, you can mark, which gives you secondary defender abilities, much like how the paladin has secondary healing abilities. You are of course still predominately a striker. You gain the "Crusader's Wrath" Zealot at-will power. Crusader's Wrath (4e Power) The Crusader's Wrath at-will power allows you to deal extra damage to your target equal to a D8, putting your damage roughly on par with other strikers. It is the righteous crusader's duty to find vengeance for injustice. Effect: You designate the target as the focus of your Wrath. When the target is struck by an attack by you, it takes an extra D8 of damage. The power lasts until you use this power against another target, or if you fail to engage the target. On your turn, you must engage the target you challenged or challenge a different target. To engage the target, you must either attack it or end your turn adjacent to it. This increases to 2d8 at level 11, and 3d8 at level 21. You gain the "Lay on Hands" and "Crusader's Vengeance" Paladin and Zealot at-will powers. These powers allow you to deal extra damage to your targets, or heal them. For the purpose of meeting prerequisites, the Lay on Hands paladin power qualifies as the same Lay on Hands power of the original paladin, in PHB1. You may only use the powers a number of times per day equal to your wisdom modifier (minimum 1), and each use of either power counts towards the other's limit, so you may only use a combination of both powers a day equal to your wisdom modifier. This means that a use of Lay on Hands or Crusader's Vengeance counts towards the daily use of either power. Special: You may only use this power or Crusader's Vengeance a number of times per day equal to your wisdom modifier (minimum 1). In addition, you may only use the power once per round. Effect: You spend one healing surge, but don't regain any hitpoints. On your next damage roll, you can add your healing surge value as extra damage. Special: You may only use this power or Lay on Hands a number of times per day equal to your wisdom modifier (minimum 1). In addition, you may only use the power once per round. You gain two Channel Divinity powers at character creation, Divine Strength and Crusader's Challenge. Once per encounter you can invoke your divine power, filling yourself with the might of your patron deity. Regardless of how many different uses for Channel Divinity you know, you can use only one such ability per encounter. Some paladins learn other uses for this feature; for instance, the divinity feats in Chapter 6 of PHB1 grant characters with access to the Channel Divinity class feature the ability to use additional special powers, or in Divine power. Trigger: You damage a creature with an attack. Your attacks not only deal damage to your enemies, but taunt them as well. Trigger: You damage a creature subject to your "Crusader's wrath" with an attack. Effect: If you successfully deal damage to a creature subject to your "Crusader's Wrath" power, you also can choose to mark the target until the end of your next turn. Special: You may use this power three times per encounter, however if you use this power you may not use any other channel divinity powers for the rest of the encounter. Crusaders gain access to the Crusader's Wrath, Channel Divinity, and Lay on Hands class features. In addition, at level 1 they gain access to two at-will powers, an encounter power and a daily power of their level. These powers as well as other paladin at-will powers are available to your character, however the powers below are not available to paladins that have not chosen the "Crusader" build. Benefit: You can choose to gain two of the following at-will powers, or select other paladin at-will powers. At level 21, the damage increases to double that damage die. You strike with boundless fury, keen to eliminate the enemy on your righteous crusade. Hit: 1[W] + Strength and Wisdom modifier radiant damage. You enact the verdict of the divine will of God, serving as their faithful servant. Special: You can use this attack as a melee basic attack. You grant combat advantage until the end of your next turn. You bring down the crushing hammer of justice, delivering the eternal fate of God. Hit: 1[W] + Strength radiant damage and the target is slowed until the end of your next turn. There are two things in life that are inevitable in time; death, and justice. Hit: 1[W] + Strength radiant damage and the target suffers a -2 penalty to all attack rolls until the end of your next turn. Through righteous vindication you avenge your allies with the power of your shield. Hit: 1[W] + Strength radiant damage and you can push the target 1 square. You can choose one of the following utility powers in replace of a Paladin power you would learn at the same level. You enter the stance of the Grand Crusader, which gives you additional power. Effect: Your enter the stance of the "Grand Crusader". While in the stance, you gain a +1 bonus to AC and enemies struck by your attacks take a -2 penalty to all defenses until the end of your next turn. You render aid to a nearby ally.